Megan Durst focuses her practice on management advisory and consulting services, business valuation and accounting services, individual and tax planning services, as well as return preparation, estate planning, compilation and review services. Her clientele ranges from individuals to large corporations in the manufacturing, real estate, wholesale, retail and professional service industries. 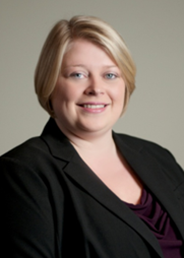 Megan joined McLain, Hill, Rugg & Associates in January 2004 and was admitted as a partner in 2018. Prior to joining the firm, she gained experience in the private company services tax department at PricewaterhouseCoopers LLP in Columbus. Megan graduated from Ohio University with a Master’s of Science in Accountancy, began her accounting career and passed the CPA exam, at the age of 21. Megan embraces the firm’s commitment to civic service and community involvement. She is a board member of various organizations, including Big Brothers Big Sisters of Muskingum, Guernsey and Morgan, Genesis Foundation, United Way of Muskingum, Perry and Morgan, President of the Dresden Elementary PTO, a past Executive Board member of the Ohio Society of CPAs and a member of the American Institute of CPAs. Megan was also awarded Rotary’s Paul Harris Fellow award in 2011 and has received awards for Top 40 under 40 from the National Association of Certified Valuators and Analysts and CPA Technology Advisor. Megan is also the proud mother of two beautiful children. She enjoys spending time outdoors with her husband, Josh, and her family. Megan can be contacted in our Newark or Zanesville offices at (800) 624-9026 or by email: mmdurst@mhrcpa.com.